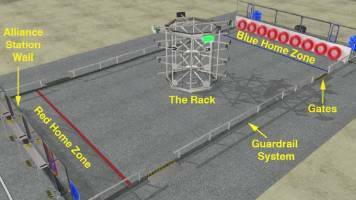 RACK N ROLL is played on a 27 by 54 foot carpeted field by two alliances of three teams each located at opposite ends of the field from where the drivers operate their robots. In the center of the field is a scoring structure known as the "rack." 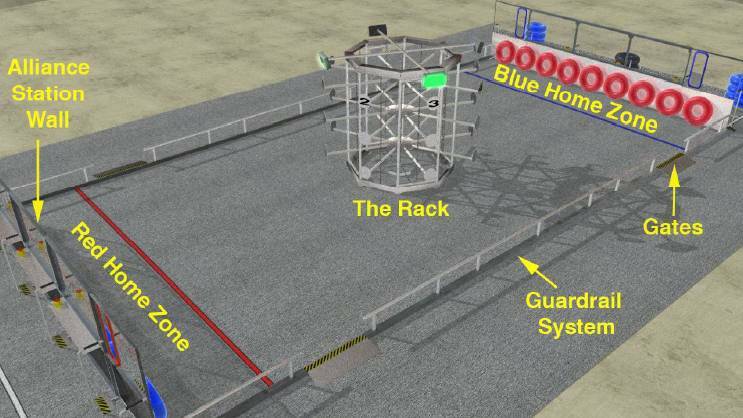 Three levels of scoring locations known as spiders are located within the rack. There are eight sets of these vertical scoring locations. Each spider hangs from a series of chains that allows it to translate and move freely if it�s impacted by a robot or game piece. The game pieces are inflatable plastic pool tubes. There are three types of game pieces used to score points for an alliance. 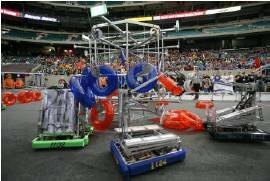 - Red or Blue alliance "Keepers" are placed only during the autonomous period. - Red or Blue alliance "Ringers" are placed during the driver tele-operated period . - Black "Spoiler" tubes are used to negate the effects of the Ringers. The objective of the game is to place the Keepers and the Ringers into horizontal or vertical rows. Similar to tic-tac-toe, but without diagonal scoring. The match starts with a 15 second autonomous period. Robots can use onboard sensors to help locate target lights over every other set of spiders which will help identify the location of the scoring targets. As the autonomous period ends, robots must drop any Keepers still in their possession. The human operators now step forward and take control of the robots. 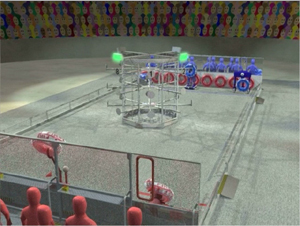 Robots can receive Ringers to score from the human players in their home zone, or from the floor in either your home zone or your opposing Alliance's home zone. The Ringers are then strategically placed on the rack spiders. Each Alliance attempts to make as many rows as possible. Black Spoiler tubes may be placed on the rack and used negate the effects of any Ringers. However, unlike the other game pieces, Spoilers can be moved. They can be picked up and relocated to cover any other ringer on the rack. Bonus points will be awarded for each of the alliance robots that are elevated off the floor in their home zone at the end of the match. The value of the bonuses is modified by the height above the floor. The final score is determined by the length and the number of rows created by game pieces and added to the bonus points. 41 Teams (.pdf, 69KB) attended the 2007 SBPLI Long Island Regional. 344 Teams (.pdf, 732KB) attended the 2007 Championship in Atlanta. 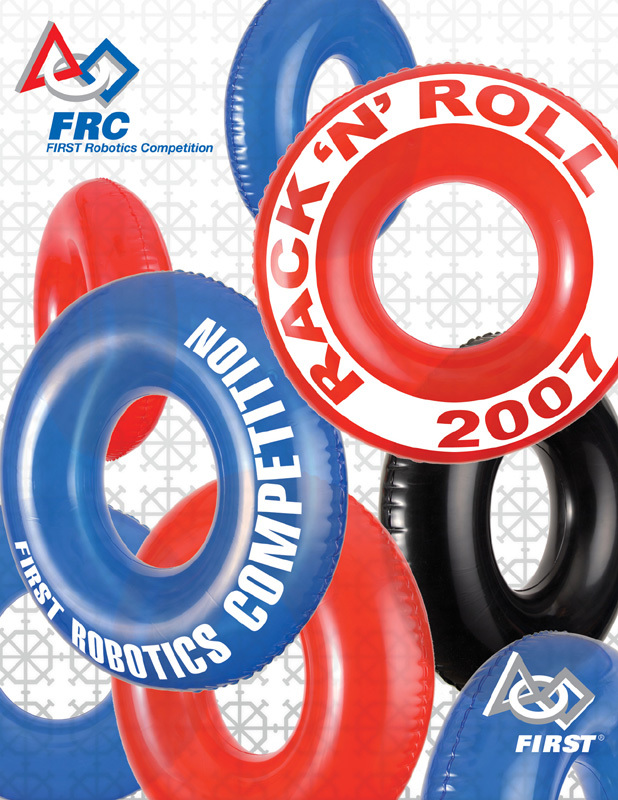 1307 Teams (.pdf, 214KB) participated in the 2007 FIRST season at 37 Regional events.